A beautiful spring day formed the ideal backdrop for Louise Nevelson’s Atmosphere and Environment XII (1970), which was rededicated on May 8, 2007. The pioneering Cor-Ten steel sculpture was returned to its base outside the west entrance of the Philadelphia Museum of Art after undergoing comprehensive conservation treatment performed by the Museum’s conservation department. The Art Association acquired the sculpture in 1972. Maria Nevelson, granddaughter of artist Louise Nevelson, speaks at the rededication of her grandmother’s sculpture “Atmosphere & Environment XII.” Photo Ginger Osborne © 2007 for the Association for Public Art. 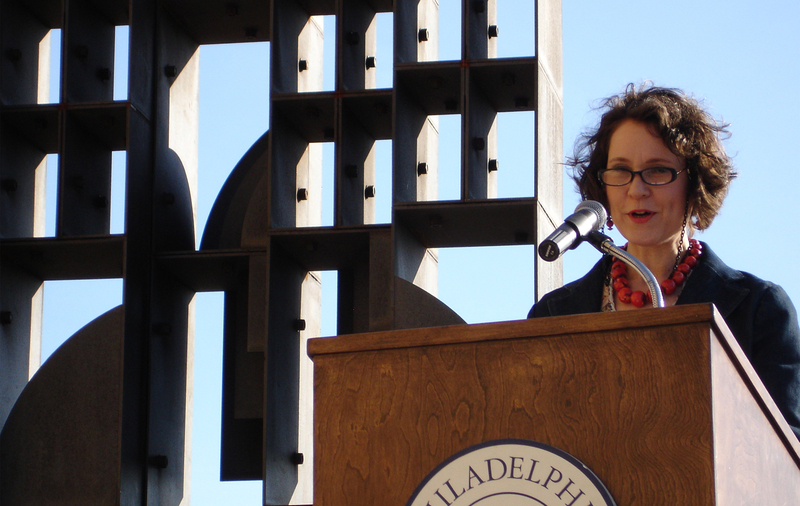 Representatives from the Art Association and the Philadelphia Museum of Art spoke at the rededication ceremony, including Penny Balkin Bach, Charles E. Mather III, and Anne d’Harnoncourt. Adam Jenkins, who oversaw the conservation process for the Museum, explained how his team painstakingly removed thousands of corroded set screws and tested new treatments for the disfigured box elements. Their work will be shared with professionals in the fields of art, architecture, and conservation/preservation. Michael McLaughlin from the Save America’s Treasures program, which supported the conservation, commented on Philadelphia’s large variety of “treasures” that have been aided by the program and introduced Maria Isak Nevelson, the artist’s granddaughter and founder of the Louise Nevelson Foundation. The rededication of Atmosphere and Environment XII coincides with an exhibition of Louise Nevelson’s work at The Jewish Museum in New York City that runs through September 16, 2007. 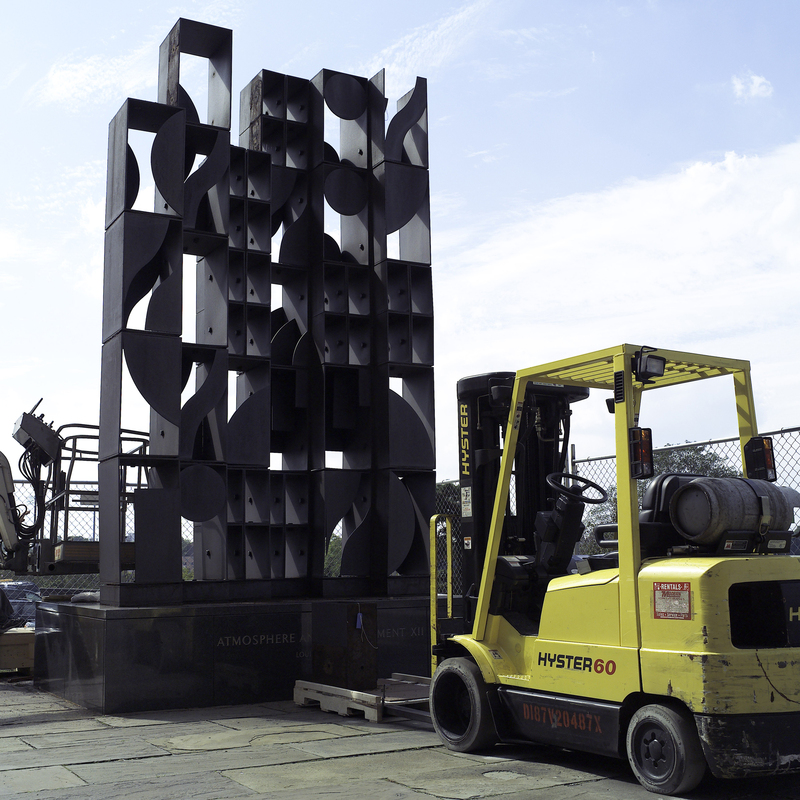 A second Nevelson sculpture, Bicentenial Dawn, will soon be reinstalled at the James A. Byrne Federal Courthouse at 6th and Market Streets in Philadelphia. Funding for the conservation treatment was provided by The Getty Foundation, the federal Save America’s Treasures program, and the Locks Foundation. Atmosphere and Environment XII is a product of the mature style of Louise Nevelson, one of the most influential artists of the decades following World War II.